In the history of the NCAA, few Division I men’s basketball programs have experienced a worse season than Marist’s 2009-2010 campaign. The Red Foxes went 1-29 under coach Chuck Martin that season. Bleacher Report, a popular online sports outlet, published an article in February of 2011 titled “College Basketball: The Worst Seasons in D-I History”, which ranked Marist’s 2009-2010 performance number 10 all-time. As a result, the Marist community’s excitement and attention has been rightfully focused on Marist’s women’s basketball team who have experience consistent post-season success. Enter Marist’s new men’s basketball coach Jeff Bower, who is set to use his experience of the game to propel the Red Foxes toward similar success. Bower brings a plethora of experience in the collegiate and professional ranks to a Marist program that last appeared in the NCAA tournament in 1987 when Bower served as an assistant to long time head coach Dave Mcgarity. 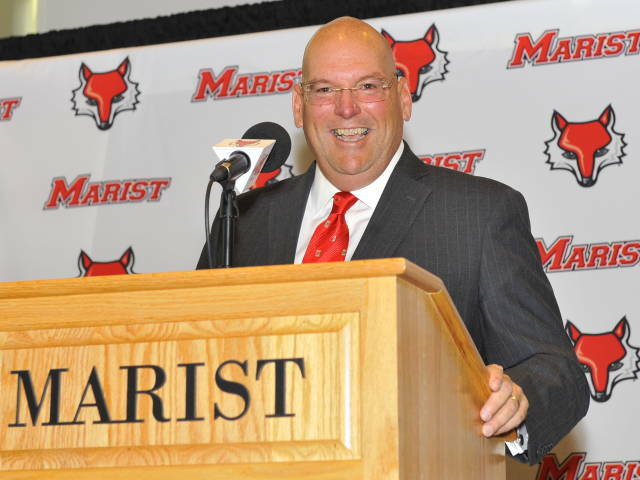 Bower knows quite well that Marist College is an atmosphere where his student-athletes can be successful. He served as an assistant coach at Marist from 1986-1990 and as an associate head coach from 1990-1995, which marks arguably the most successful era in Marist men’s basketball history. Bower is no stranger to history either. He graduated from St. Francis College (P.A.) with a degree in history/education. Teaching is a passion for Bower whether the subject is history or basketball. “Coach Bower mostly preaches execution and attention to detail…Execution and detail beat talent…He loves the game and loves to teach the game,” said sophomore center Eric Truog. The thoroughness Bower shows during interviews, practices and games is a characteristic that he has molded into a dependable skill. This thoroughness and attention to detail became a practical skill during his tenure with the former Charlotte Hornets of the National Basketball Association (NBA) as an advanced scout. Bower has proved that he can climb through basketball’s ranks, which is what distinguished him from other candidates in the eyes of Marist’s Director of Athletics Tim Murray. “Jeff has a skill set that is different than most college coaches…He started in the trenches as an advanced scout (in the NBA), which is a real grinding job. You really get a feel for the game of basketball,” said Murray. Bower’s thorough approach to recruiting will facilitate the success of future teams while also generating more excitement for the student body. “The time coach Bower spent in the NBA working as an evaluator of talent gives him insight on what type of players you need in order to be successful,” said Thomas Lappas, a current junior and nephew of former Villanova University basketball coach Steve Lappas. Bower hopes to see this transformation come to fruition over the course of this season and beyond. However, both Bower, Murray and the Marist community understand the process and realize that it will not happen overnight. “He does seem like a good fit for Marist, since he has worked there before and knows the community well, and likes being in the community. He has a lot of work to do, but if Marist is patient, it could end up being a successful hire,” said Poughkeepsie Journal sports reporter Phil Strum. Recently, the NCAA has been littered with schools that have committed countless academic violations due in part to their parochial view that is fixated on revenue and championship results. However, under Bower’s supervision the Marist community will see a program that accomplishes success the right way. The community will be proud of the work that the student-athletes and coaches are producing both on and off of the court. The Marist community can expect the same during Jeff Bower’s tenure as the head coach of Marist College’s men’s basketball team. This entry was posted in Sports and tagged Athlete profiles. Bookmark the permalink.